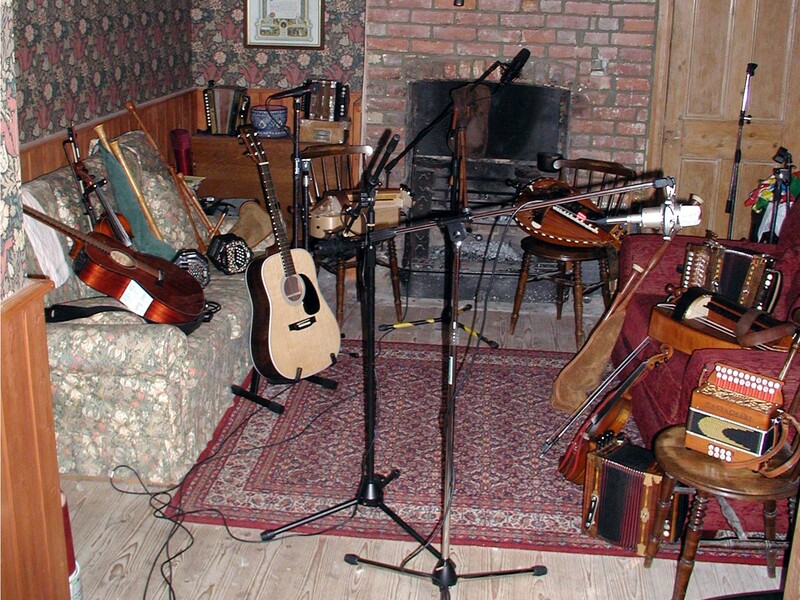 These tunes were recorded in our front room as examples of acoustic, background music for wedding receptions, garden parties and other events. No studio 'tweaking' has been used. Instruments include hurdy gurdy, fiddle, guitar, English & Anglo concertinas, English medieval bagpipes and melodeons. Most of the events we play at are private functions - weddings, parties and 'corporate' gatherings. Just as you would probably not like to have gatecrashers wanting to have a listen at your dance, so it can be very hard to arrange a suitable evening for you to come to and see us live - although we do attend some wedding fairs and perform at charity events that are open to all. Whilst I've asked several times if we can have permission to film, there has always been an objection from at least one person - not surprising, as usually families are involved, or members of staff letting their hair down more than a little! Audio recording has proved less of a problem however, and there are seven tracks available, recorded live at a wedding on April 18th 2009 via the link above. No studio tricks or enhancements were used, we just set up a small, portable recorder on the table behind us to record some of the tunes and dances. If the tracks are two large for you to play, or you don't have broadband, I can 'burn' and send a CD to you. The aim was to provide an accurate, 'warts and all' recording for you. Me on squeeze box, Rob on fiddle or guitar, the caller was Malcolm. Line-up as per picture above, apart from me on melodeon in the recordings, rather than the bagpipes. We were joined on triangle for some tracks by an ethusiastic young guest who wanted to play along. Whilst not perhaps up to the standard of Evelyn Glennie, she had great fun and it did add to the ambience of the event. Our aim is to make your event as 'fun' and inclusive as possible. As my old web site was creaking at the seams when these were recorded, I hosted them on our sister site (which covers medieval entertainment).Just click on the link to hear Barn dance music samples.